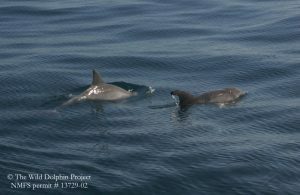 With the rough boating weather we have been having, the Wild Dolphin Project crew has been itching to get back to sea! We caught a break the first week of the new year, so we headed out to calm, local waters to search for dolphins! 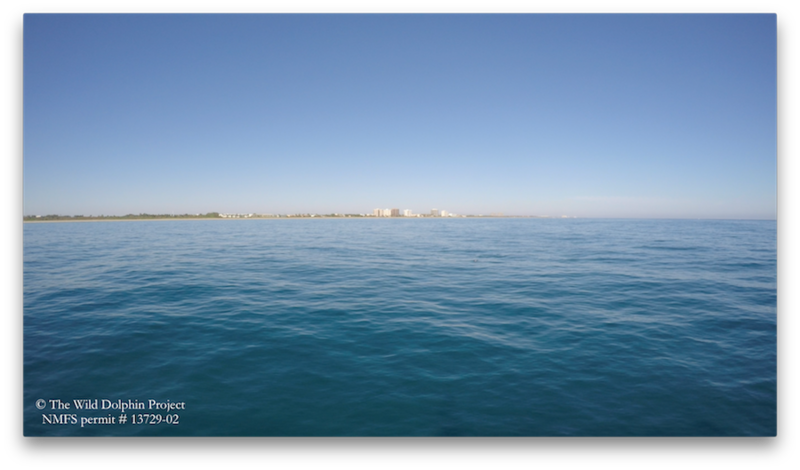 The Wild Dolphin Project has a U.S. permit that allows us to do basic dolphin research off the coast of South Florida, in addition to our regular work in the Bahamas. 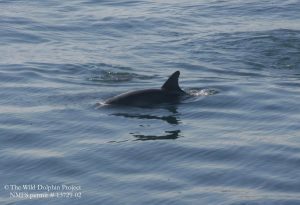 Joining us were some local Wild Dolphin Project members – a membership offers them the opportunity to join us aboard Stenella to see some of our Florida work first hand. We emerged from the Palm Beach inlet, and just 30 minutes into our trip, we were greeted by a group of 6 bottlenose dolphins! They were mothers with their calves, so they were a bit skittish. We collected our data, such as the location, depth, and group size, took some photographs of their dorsal fins for photo identification, and continued on. Not long after, a small group of 4 bottlenose dolphins appeared. They seemed to be feeding along the sandy bottom, as they would dive down and, after some time, reappear at the surface with a burst of breath. One dolphin delightfully chased a fish along the surface of the water (see video). Later in the morning, we encountered a larger group of 12 bottlenose dolphins, followed by another group of around 8 bottlenose dolphins. We continued our data collection, and snapped some photos. There were many distinct dorsal fins, filled with nicks and notches. One dolphin even had a piece of wounded flesh dangling from the tip of their dorsal fin. These distinct markings, as well as coloration patterns and scars, help us to identify individuals in the population. Although helpful for us researchers, identifying marks such as these are often the result of shark bites, fishing line entanglements, boat propellers, and dolphin aggression. There is a need for more information and research on species diversity, abundance, distribution, and residency of our local marine life, off the coast of Southeast Florida. Though winter weather can complicate things, The Wild Dolphin Project has been trying to incorporate these “Florida days” into our off-season routine to expand our knowledge, and to help fill this void in the scientific community. For more information on how you can get involved with our Florida work, please see our memberships page. Members who maintain a membership at the “Speckled” level or higher will get an email invitation to join us for our “Florida Days” surveying along the Florida coast.